Charging . . . . I went to use my laptop the other day and to my surprise instead of the usual Windows logo as my computer booted up, I was met by a blank screen. I had forgotten to charge it! It’s a lot like our faith. If we don’t keep our level of faith at the maximum level, and know where our hope and trust is before we go through the trials of this life, we will easily switch to defense instead of offense. Ultimately, we are only as good as the charging system we are using. If we are getting plugged into God on a daily basis, we can handle more throughout the day, than we could if we were just charged up once a week on Sunday. 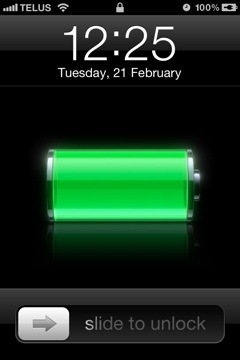 My iPhone has an app that tells you what it is capable of doing based on the current charge level. It tells you how many minutes of call time, game time, watching movies, or Internet surfing it would take to drain the battery. It’s pretty neat actually. What if we were able to examine our own faith in this way? What do you think your current faith could sustain you through? Bad news at work? A vehicle breakdown and respective repairs? A sick child/spouse? You might think I’m focusing an awful lot on the negative, don’t get me wrong, ultimately I am trying to provoke us to thinking. Are you satisfied with the level of faith you have right now? Do you need to upgrade your charging frequency or even the power source itself? Maybe you need to get plugged into a church again, maybe you need to incorporate a daily devotional or prayer time into your schedule. It’s highly inconvenient to be unable to make a call when the phone won’t turn on, or draft a blog post on a laptop that won’t power up. But it’s more than just inconvenient to try to navigate through the trials of life blind and relying on yourself rather than God, it can be devastating. There are some that say that once you are a Christ-follower, life gets easy. They say you’ll never get sick, you’ll always get what you ask for, and you’ll never have to experience pain. That’s not what God’s Word says though, it tells us that we are guaranteed trials and tribulations. John 16:33 says “I have told you these things, so that in me you may have peace. In this world you will have trouble. But take heart! I have overcome the world.” God doesn’t want us to be naive about the reality of trouble on earth, but He doesn’t want us discouraged or worried about it either. He wants us to have peace above all, and confidence in His abilities to take us through the troubles. I am even reminded of David’s Psalm (Psalms 23) where it says, “Yea, though I walk through the valley of the shadow of death, I will fear no evil; for You are with me; Your rod and Your staff, they comfort me.” Notice it says that we are to walk “through” the valley of the shadow of death, we aren’t supposed to stay there forever, it’s not our permanent residence. Living a life of faith doesn’t make everything easy, or even comfortable for that matter, but faith does make it possible to push through (and past) all that comes our way. Take some time today to take measure of your faith, and decide if you are satisfied with where it is at, or whether you want to increase it. The choice is yours. Let’s all expect the best, but prepare for the worst.